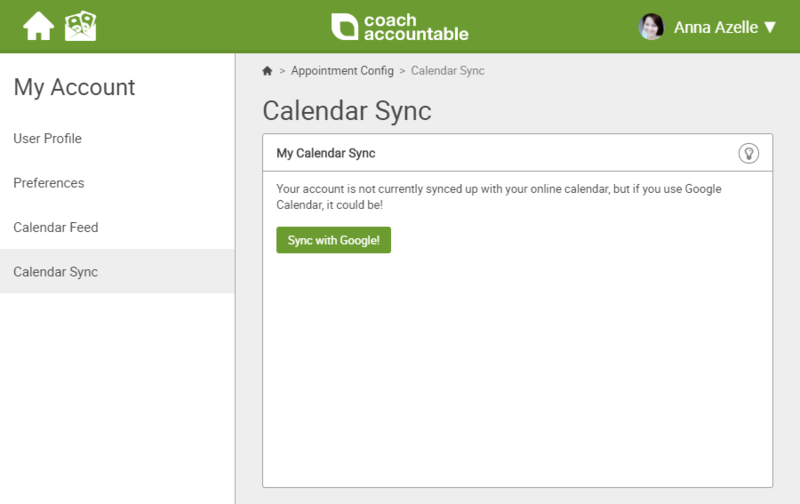 CoachAccountable publishes a data feed of your appointments which your calendar can subscribe to, allowing those appointments to appear alongside your regular calendar events. CoachAccountable can subscribe to a data feed of your calendar events for the sake of knowing when you’re busy to prevent double bookings. Calendar systems can be lax about pulling coaching appointment data from CoachAccountable. Though the data as offered by CA is always up to date, there can be a lag in how long it takes your calendar to pull over whatever’s new. Google Calendar in particular is a bit notorious for updating from such data feeds only once every 24 hours. Having your CoachAccountable appointments present as a separate calendar collection of events is often not nearly as nice as having those events posted directly into your primary calendar collection of events. Other scheduling systems might know when you’re busy based on your primary calendar, but that might not include a separate calendar collection without subscribing to THAT one, too (if even possible). To overcome these drawbacks I’m happy to report that our online coaching tool now supports a direct integration for syncing with your Google Calendar. 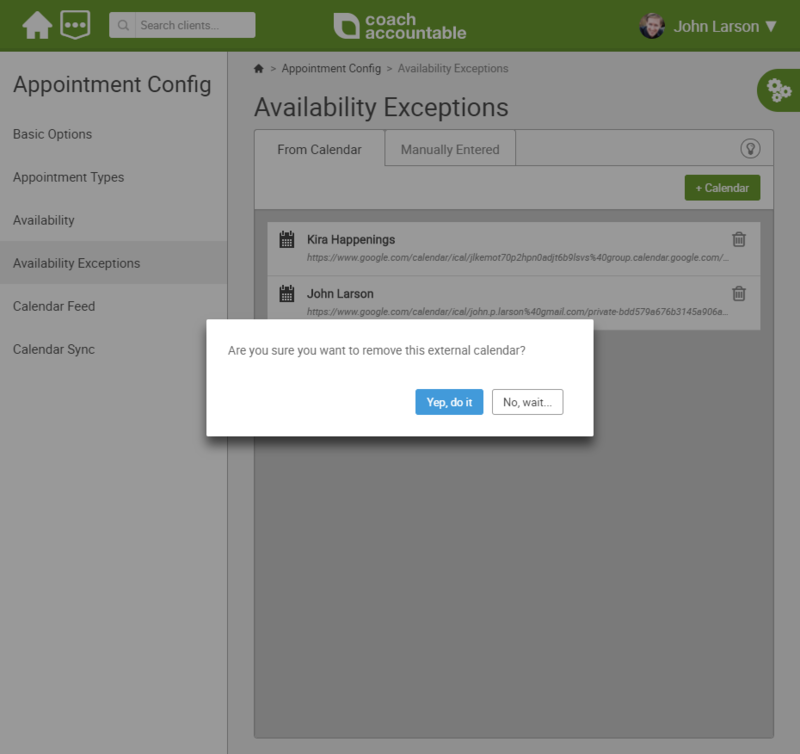 You’ll find the place to set this up under Settings >> Appointment Config >> Calendar Sync. Note that this is only available for accounts that are on Version 3. If you don’t see the Calendar Sync item that means your account is still on Version 2. If you own the account, you can switch it over to 3 from the top right user menu >> My Account >> Version. This screen is very chipper, but when you see how painless the process is you’ll understand why. The question is: do you trust CoachAccountable? Promise there’s nothing shady about CA having access–strictly professional, yo. Just a few choices here and you’re done, where to publish to (if at all), and where to read from. If you want (and you probably do! ), CA will publish your appointments to the calendar of your choice. Pick one and they’ll magically appear there within seconds. Choosing which calendars CA should read from tells CA where to look in order to accurately determine when you’re available and when you’re busy. You might want to skip certain calendars. For example my wife and I share a calendar of events, but I don’t need to have my availability blocked when she puts on there, say, a day visit with the kids to Grandma’s house (on the contrary, I generally have more free time then! :). And that’s it! Once set, CA will post new appointments (and updates made to them, including cancellations performed by your clients) to your calendar as they arise, with lag time measured in seconds rather than hours. Similarly, when CA has direct read access to your calendars the process of keeping up to date in order to provide accurate availability options is nearly instantaneous, rather than taking up to 5-10 seconds to pull all the data over with the data feed approach. Yep, we’re sure. We’ve got a better way now to keep abreast of calendar availability. How about for my clients? Your clients can similarly set up a direct sync with THEIR Google Calendar. 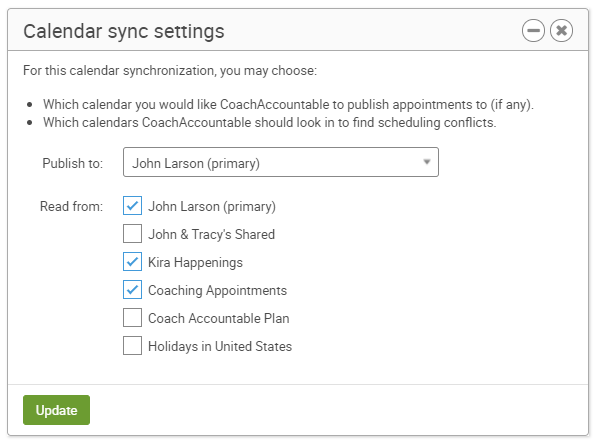 They won’t have to pick which calendars CA should read of theirs (because that’s not relevant on their side of the equation), BUT they too can have their appointments with you set via CoachAccountable appear right in their calendar. Nice! Every bit as easy for them as it was for you. More so, even. What if I don’t use Google Calendar? The old system of subscribing to calendar data feeds remains intact, and is, as it has been for years, a fine 80% solution. If you use Apple iCal or Microsoft Outlook, I may in the future build more direct API-based integrations with those, too. For what it’s worth though, syncing between those systems and Google Calendar is a well-worn path. 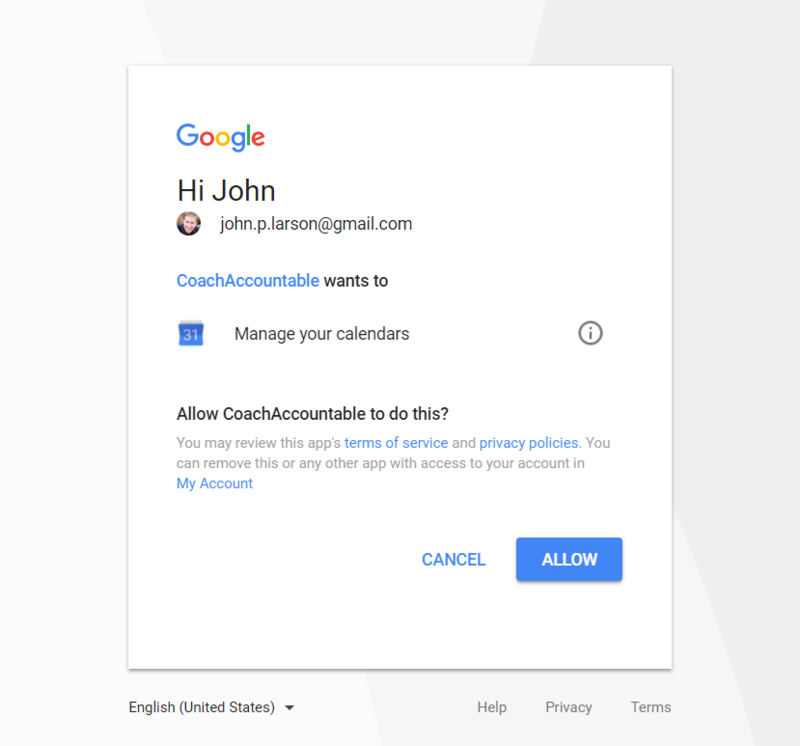 So you might set up a Google Calendar account, sync your other calendar with that, and THEN sync CoachAccountable with that Google Calendar to more or less have Google serve as an intermediary to sync with your calendar system of choice. Yay, technology! And that’s it! If you’ve had troubles with appointment scheduling in CA because the data feed approach didn’t play nicely with other scheduling systems, the direct calendar sync approach should be the perfect fix for you and your coaching practice. Enjoy! Get rid of your clunky extra calendar integrations while elevating the level of service you provide your coaching clients. Try out CoachAccountable free for 30 days. Yeah yeah. Excellent update John. For people like me who still use office 365 (or iCLoud) as their main calendar I can recommend syncgene as an hands-off easy and accurate syncing engine. No affiliation or anything, it just does the job without needing an addin for Outlook or any messing about.